Man (and/or woman) has studied the stars for eons. Many understand the correlation of the larger bodies in the universe having an effect on the smaller bodies in the universe. Here are my favorite sites that I check out a few times a week and compare against my weekly and annual tarot readings. 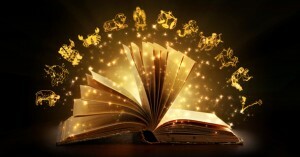 Astrologyzone.com – Susan Miller is, hands-down, my absolute favorite astrologer. I pay for her daily horoscopes, but she offers free seriously in-depth (as in lengthy) monthly horoscopes released on the first of every month. She will make a believer out of the astrology skeptic. World-of-Wisdom.com – This site offers free daily, weekly, monthly and annual sun sign horoscopes. This is also where I purchased my astrology software. Quick and insightful ‘scopes. Tarot.com – I call this the “bad news Bob” astrology site. Where many of the astrologers I follow try, like me, to put a positive spin on events, these guys tell it like it is, and rarely include warm and fuzzies. They offer daily, weekly and monthly sun sign horoscopes along with love and career ‘scopes too. Astrologyking.com (formerly darkstarastrology) – free monthly (and yearly) horoscopes broken down by decan (based on the individual degree) of the sun sign. Astro.com (formerly astrodienst) – Liz Greene is an incredible astrologer offering free daily “pieces” of the individual horoscope along with other cool stuff on her site. I find her prices a bit high, but I enjoy the freebies on the site. Please feel free to comment with any great sites that offer awesome freebie astrology! If you’re interested in astrology (and/or tarot), make sure to order a printed copy of my book, “Personalities of the Tarot (A Guide to Know Thyself Through Astrology and Tarot)”. I prefer the print version over the digi. astro websites, astrology on the web, astrology site, astrology sites, free astrology, western astrology. Bookmark. Don’t Freak Out. I Read Tarot Cards. Thanks for the list of your favourite Astrology sites. I don’t see a site dedicated to career astrology in your list and wondered could I humbly offer my own for consideration?.